When Ian & I first reached Princes Road Synagogue in the car, we went straight past it. It was only on the second drive along Princes Road that we realised we must have found our (unnamed) building. With rows of lofty Victorian terrace houses and deserted husks of houses of worship of various dominations, Princes Road in Toxteth, Liverpool, wistfully communicates a sense of a more prosperous era long since past. Nestled amongst all these houses and battered old churches, Princes Road Synagogue is initially somewhat unremarkable. The façade has character and contains notable elements reminiscent of the Dohany Street Synagogue or Central Synagogue New York, but on this run down street it seems somewhat muted. 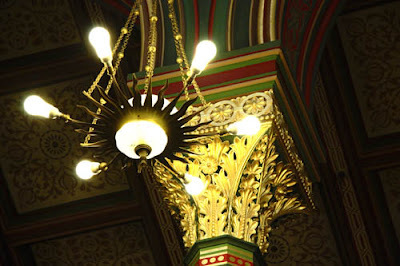 Enter the synagogue, however, and a completely different visual experience is revealed. Princes Road Synagogue is like a small, beautifully vibrant and stylistically busy Dohany Street Synagogue. 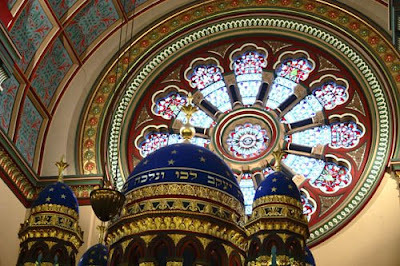 With one gallery and no central row of candelabras, the synagogue contains unique choir stalls perched above a stunning Byzantine-style Ark with a deep blue cupola, beautiful rose windows and an extraordinary variety of patterns on the walls and ceilings. On Sunday we had little time to appreciate such detail however as we tip-toed around the galleries in order to film shots of a civic ceremony that was taking place below us that afternoon. 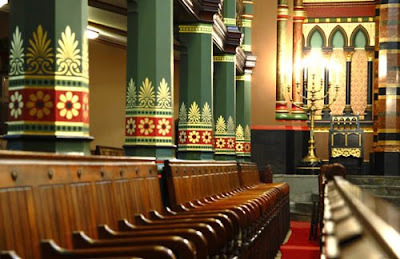 The synagogue was packed with their congregation and various dignitaries of Liverpool, including the Lord Mayor and his entourage. We snuck around filming shots of a busy congregation and readings accompanied by melodious singing from the uniquely mixed choir, as conducted by our interviewee, Naomi Hoyland. In the last section of the ceremony Ian and I managed to creep up the small spiral staircase leading up to the choir stalls and grab some shots of Naomi conducting as the choir sungs their hearts out. Before we knew it the service was over and Eddie the caretaker was keen to lock up for the night. Early the next morning we set about filming with Naomi, as she told us the story of how the synagogue came to be, who frequented it, its situation today and her own connections with the building. 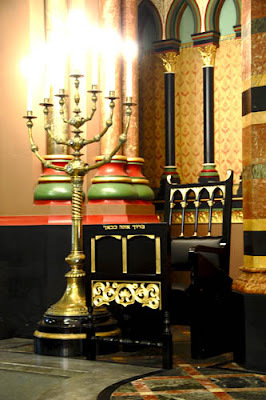 The synagogue had originally been created in the nineteenth-century for the wealthy Jews in Liverpool who wanted a grand synagogue to match their status -- the existing one in town was not opulent enough and anyway they wanted one nearer their smart homes. A competition was held and two Scottish architects, the Audsley brothers, won the commission. They had also built the Welsh Presbyterian Church on the other side of the street – which now very sadly sits as a Gothic shell, falling down and bordered up. The congregation all put in what money they could afford to fund the new building – as two plaques in the lobby attest. 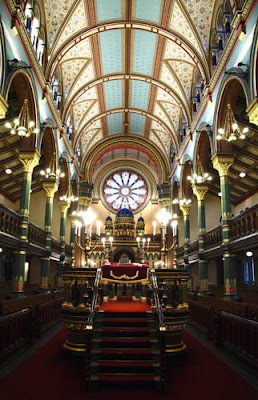 The Audsley brothers apparently travelled the world picking out beautiful and eclectic designs which they blended together for the interior of the synagogue. The congregation had never seen anything liked it and loved it! Naomi Hoyland has attended the synagogue every Saturday since she was three years old. Her father and uncle had attended Princes Road since they were teens and when they discovered at the start of the Second World War that a bout of rhumatic fever counted them out of going to fight, they used their time wisely, acting as ARP officers and building up the Synagogue choir with members of their own family, including the very young Naomi. She and her cousin never left the choir and introduced their equally musical children to it from a very young age. The two of them now share the duties of conducting the choir and both are passionate about the survival of the choir, as well as of the building itself. "When I work, I believe in God"
"O Jerusalem, the holy city"